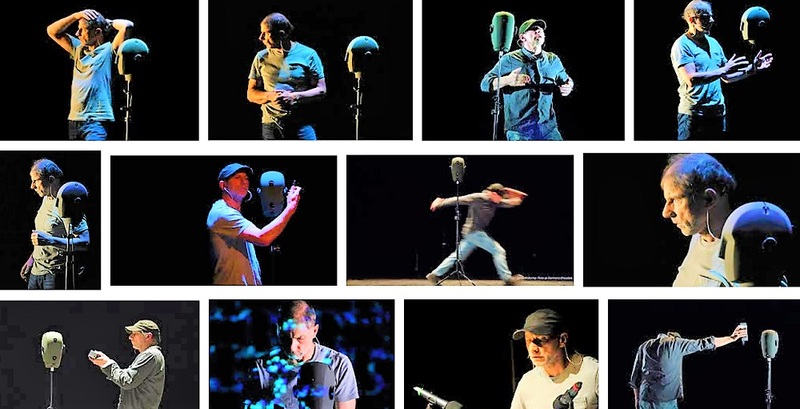 Simon McBurney, master storyteller, tells the unforgettable tale of ‘The Encounter’ at The Curran. Photo Credit: Curran Theatre. ‘The Encounter’ is, putativelyy, a “one man show,” with Simon McBurney credited as “Director and Performer.” But don’t be taken in, Take a look at the extensive list of credits at the bottom of this review, and consider, also, that this performance is inspired by a book (“Amazon Beaming”) by Petru Popescu, which in turn was inspired by the real life experiences of National Geographic photographer Loren McIntyre. And McIntyre was inspired by his encounter with the Mayoruna people (sometimes called the “cat people” who consider themselves to be descendants of jaguars) while seeking to find the fartherest source of the Amazon (which he located at the lake now known as Lake Laguna McIntyre). All of which is to say that this “one man show” is, in fact, an extensive collaboration. And calling it “extraordinary” hardly does it justice. ‘The Encounter’ is a life itself, not a mere night’s entertainment, provided you bring an open heart, mind, an d ears. It may be the most intimate theatrical experience you’ll ever have. McBurney and his colleagues, sound designers Gareth Fry and Pete Malkin, decided to take an unusual approach to this material. Eliminating both actors and sets almost entirely, the tale is told solely by McBurney with the support of an extensive audio production that blows the mind. Sound effects? You’ve never heard anything like this. Each audience member wears a headset to ensure an intimate experience. How intimate? The earphones are actually temperature controlled: at one moment, the illusion is created that Mr. McBurney is standing by your right shoulder, just out of sight—you will turn your head when he speak. Then he blows in your ear. It’s this sort of thing that prompted a New York Times reviewer to describe the production as “one of the most fully immersive theatre pieces ever created.” Indeed it is. But all the technical pyrotechnics, wonderful as they are, would be merely a trick were it not for the story. In McBurney’s presentation, this is as close to an actual journey to the Amazon basin most of us are ever likely to experience without the aid of a travel agent. McBurney brings to life the Mayoruna people, as well as the sounds and sensations of his London apartment, his family, his memories of colleagues, his thoughts on indigenous peoples, climate change, the planet and life itself. It is an open hearted performance like no other. This is a short review, partly because the experience of “The Encounter” is truly unique and thus difficult to difficult to describe, and partly because I know that nothing I say will be adequate. ‘The Encounter’ plays at The Curran Theater through May 7. For futher information, click here. “The Encounter”, by Complicite/Simon McBurney, inspired by the book “Amazon Beaming” by Petru Popescu. Director and Performer: Simon McBurney. Co-Director: Kirsty Houseley. Associate Director: Jemima James. Design: Michael Levine. Sound: Gareth Fry with Pete Malkin. Lighting: Paul Anderson. Projection: Will Duke. Production Manager: Niall Black. Sound Supervisor: Guy Coletta. Sound Engineer: Laura Hammond. Sound Engineer: Laura Hammond. Sound Engineer: Samantha Broomfield. Associate Lighting Designer: Laurence Russell. Projection Supervisor: Sam Hunt. Technical Stage Manager: Sam Phillips. Company Stage Manager: Joanne Woolley. Assistant Stage Manager: Holly Gould. Assistant Producer: Naomi Webb. Associate Producer: Poppy Keeling. Producer: Judith Dimant. With the voices of: Romeo Corisep Dreve, Claudia Hammond, David Farmer, Chris Frith, George Marshall, Noma McBurney, Iain McGilchrist, Petru Popescu, Iris Friedman, Steven Rose, Marcus du Sautoy, Rebecca Spooner, Jess Worth, and Nixiwaka Yawanawa. Artistic Collaborators: David Annen, Simon Dormandy,Naomi Frederick, Victoria Gould, Richard Katz, Tim McMullan, Tom Morris, and Saskia Reeves.